As with any new social content creation platform, we wonder how we can add yet another thing to platforms to create for and manage. In my content creation masterclasses, I teach to create content that can be created, used and repurposed on different platforms. We have more thoughts, more things to say, more moments that move us than we sometimes think. We all have tips to share. It doesn’t matter what it’s about. Use this for Tip Tuesday or Thursday. These tips don’t have to be related to your biz or passion, they could be tips about anything you like. Sharing cooking tips. Or tips on how to increase your running time. You’ll be surprised at how even these seemingly non-business related tips will draw people to check you out. From sharing tips, partnerships, gigs, customers, and clients can emerge. Our core message and content is sometimes too much to share in one sitting. We know months, even years, of information. Using anchor, we can share bite size bits of our core content. Lead them to your email list, website, or offer.Or encourage dialogue by encouraging listeners to call in to your station. 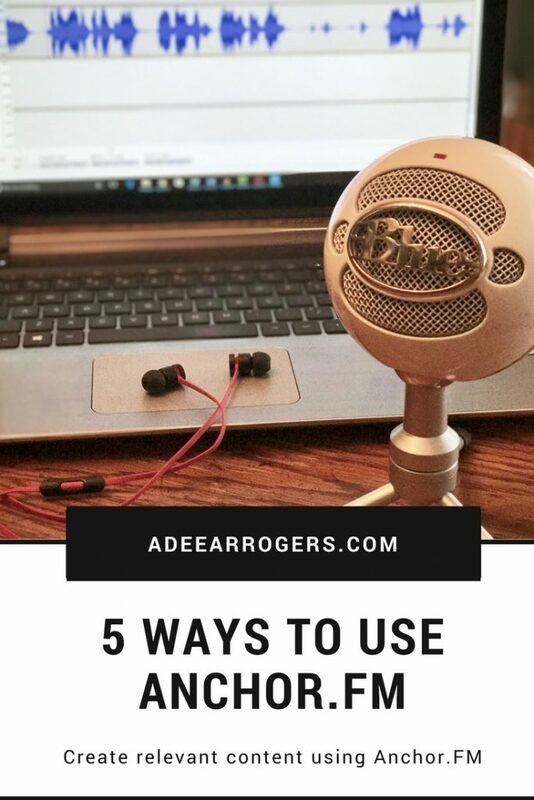 For your podcast interviews, take a few minutes and ask “rapid fire questions.” This allows you and your listeners to get to know your guest in a light hearted, more relaxed way. Check out this pretty exhaustive list of 250 rapid fire questions. Something interesting happening in pop culture? Hop on Anchor and share your thoughts. Pop culture is often an “in the moment” thing. Grabbing your phone and sharing your thoughts via Anchor is a great way to join in on the conversation and make your voice known and heard. If you’re shy about fully committing to podcasting, or you want an “on the go” option, consider signing up for Anchor.fm (you should grab your brand name or name anyway). If you’ve been considering podcasting, join my email list to get my 7 day podcast creation checklist. I also have a Podcast with Purpose course available in my e-store. Share your ideas of ways you use or can use Anchor.fm.